Tsunku, the founder and producer of idol pop group Morning Musume, has updated his blog with tremendous news for fans; Kamei Eri, JunJun, and LinLin will be graduating from Morning Musume and a 9th generation audition will be held to fill their spots. The producer went on to explain the reasons behind the departures. Kamei Eri has aparently been suffering from a skin condition called atopic dermatitis ever since she has joined the idol industry. It is a type of eczema that causes discoloration of the skin, which she usually hides with large amount of makeup when she goes on stage and takes medication because of it. However it is hard for her to fully recover from the condition due to the makeup, copious costume changes, and sweating from exercise and performances. Tsunku states that the condition could possibly move to an internal level, and even more so, has begun to affect Kamei on a mental level. She has therefore decided to leave Morning Musume to get her condition properly treated. It is unsure whether Kamei will rejoin the entertainment industry after her treatment. The two Chinese members of Morning Musume, JunJun and LinLin, are leaving for different reasons. Tsunku states that they have grown as both singers and Japanese speakers and are now women who are capable of standing on their own two feet. They will be graduating and returning to China to continue their entertainment careers there. All three graduations will take place at the same time, the final show of the Morning Musume's 2010 fall tour. While announcing the graduations of three of the members of Morning Musume, Tsunku also announced an audition for the 9th generation of the group. On his blog he states that he is looking for a girl that is between 10-17 years old, is healthy, wants to be number one in the entertainment world, and loves Morning Musume. It looks like fans will be seeing a drastically different Morning Musume by the end of the year. This is first time an audition has been held for the group since 2006, when Aika Mitsui was added. The group has been relatively stable for the past several years and this is definitely the biggest shake up of members in a long time. Eri Kamei came to me several times regarding her health condition. One time, she said to me : "I would like to find the time to cure the atopic dermatitis that I'm suffering from". Since the time she joined the Morning Musume。, it looks like she was dealing with symptoms like itching and slight skin color changes. She took medication to calm the symptoms down and she also used make-up to cover it but during live concerts, there is a lot of sweat and many outfits to put on, which made her recovery very difficult. Some may say it is "just a skin problem" but according to doctors, an external problem like skin problem may move to an internal level. It may as well have an impact on her spirit, her mental level. Also, for her, it is a serious thing so she decided to focus on her recovery instead of letting it continue. Eri Kamei will graduate from the Morning Musume。 and Hello! Project on the last day of the Morning Musume。Autumn 2010 concert tour. As for her activities after that, I intend to discuss with her after her full recovery. 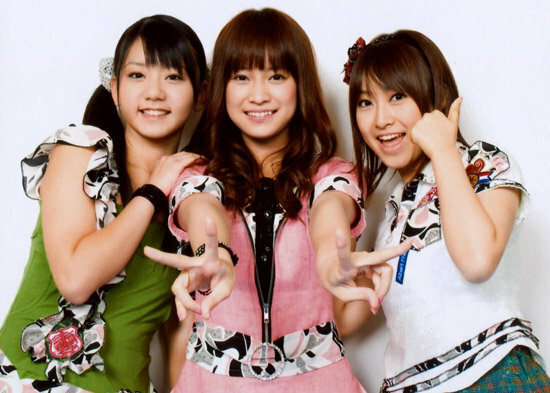 In May 2005*, both of them joined the Morning Musume。as foreign students and today, while being skilled singers and entertainers, they also greatly improved their japanese proficiency and they are now grown-up women. This is why I took the decision to graduate both of them at the same time as Eri Kamei on the last day of the Morning Musume。Autumn 2010 concert tour. *Note: They translated this wrong, JunJun and LinLin joined in 2007.